Open Innovation describes an emergent model of innovation in which firms draw on research and development that may lie outside their own boundaries. In some cases, such as open source software, this research and development can take place in a non-proprietary manner. Henry Chesbrough and his collaborators investigate this phenomenon, linking the practice of innovation to the established body of innovation research, showing what's new and what's familiar in the process. 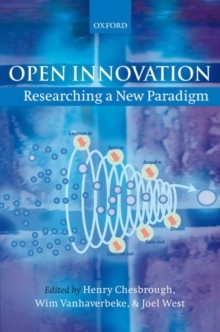 Offering theoretical explanations for the use (and limits) of open innovation, the book examines the applicability of the concept, implications for the boundaries of firms, the potential of open innovation to prove successful, and implications for intellectual property policies and practices. The book will be key reading for academics, researchers, and graduate students of innovation and technology management.